Sorry, but that expression suggests some unwanted chaffing in some tender area or other; which no amount of top level meetings and hand shakes is gonna get rid of. #7 hahahaha... Terminator "I'll be Black"
does he have any other color to wear??!! #9 Hey smartass, noticed the background and the lady on the left don't change either? Go figure. Well I guess he wears the same tie and suit all the time as well. #10 Hey jackass, i am not gonna even try to explain you that. #12 that makes no sense. Are you high? #10 was stating that all these photos were taken at the same place, just with different people accompanying Obama and his wife. This shouldn't have to be pointed out as it is quite obvious. I think it is also quite obvious you still lack a 3 digit IQ. "Ladies and gentlemen, your President is a robot. Or a wax sculpture. Maybe a cardboard cutout. All I know is no human being has a photo smile this amazingly consistent. On Wednesday, the Obamas hosted a reception at the Metropolitan Museum of Art in New York, during which they stood for 130 photographs with visiting foreign dignitaries in town for the UN meeting. The President has exactly the same smile in every single shot. See for yourself — the pictures are up on the State Department’s flickr (link below). And, of course, compressed into 20 seconds for your viewing pleasure. Music is "Cold Hands" by the Black Lips. Go buy it now! Geeze, you guys amaze me, "jackass, smartass," I thought there were alot of video wizards at this site, guess not. How about dumbass?! How come him and his wife always wear the same cloths on those photos? I have a Dream of a face comforting with confidence. Telling me to go back to a deep sleep. Isnt this some wax musseum? cant belive this. Awww... Did the bad man oust your good ol' boys plutocratic republican party, #(removed comment)? He's smiling like that because he knows that the worms are seething in their holes, reminiscing for the days when you could just whip a boy and be done with it. #13 I don't think you have an IQ at all. I was just kidding when that guy had to tell me a smartass. Is it mandatory to put smileys so that other's understand?? Why don't you and messmaker have brains? she likes that dress i guess! Real man, you can see his thumb moving. I swear to god you can see his face gaining and losing weight all the time. he also has a consistent tie. To all you dimwits who talk about the consistent tie. I don't know how many infer this as I'm not going to count em but #30 and ESPECIALLY the dumb "Spiked(blind)Silver" (#31), are good examples. Did it ever occur to you to read a few of the other comments before jumping the gun, and assuming these are multiple photo ops? 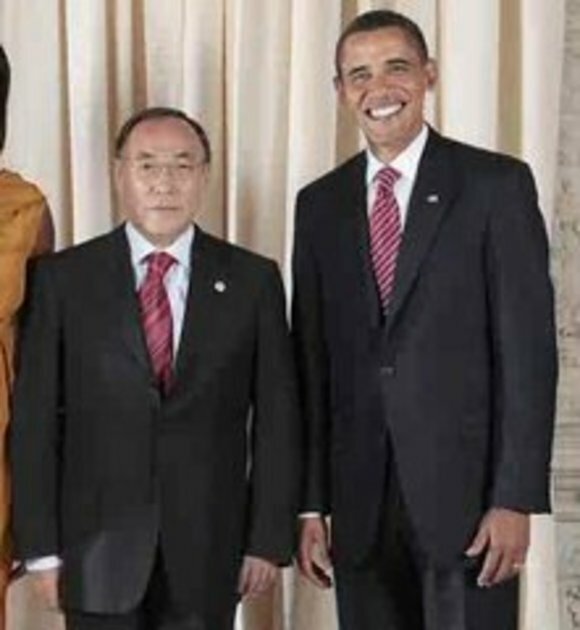 I noticed right away that this was a photo op taken on the SAME DAY as Mr. BingBang (#16) stated in HIS comment. He says (in part) "the Obamas hosted a reception at the Metropolitan Museum of Art in New York, during which they stood for 130 photographs with visiting foreign dignitaries in town for the UN meeting." Got that didja? Aside from that, he ain't smilin' too much these days. Installing him was the biggest mistake the U.S. ever made. Well, not quite the biggest, but it's up there with the biggies. Before you make a comment people, at least look at the video a little closer before making a fool out of yourselves!